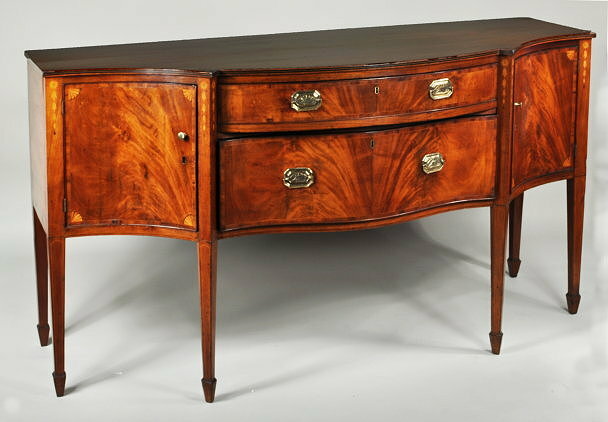 Very fine hepplewhite inlaid mahogany serpentine sideboard, having a solid top with ebony and string inlaid edge, above a bowed central drawer and serpentine shaped lower drawer, flanked by two cabinet doors, all with string inlaid and crossbanded edge and inlaid quarter fans; the stiles inlaid with floral and bellflower inlays, above square tapering legs with string inlay ending in spade feet. School of Edmund Johnson, Salem, Mass., circa 1795. Identical to previously sold Inventory #6443, descended in the Mellon family to Gov. Harriman, to the Lawrence Family of Long Island. 72" long, 29 1/2" deep, 41 1/2" high.